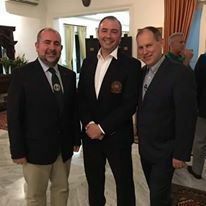 Pictured below is Kevin Sullivan with his excellency the Irish ambassador to Indonesia Kyle O'Sullivan, and Tom Redmond his diplomatic aide at the official reception for the Irish team in Jakarta for the world championships. What an honor and privilege to meet them in the Irish embassy. Good luck to Kevin who competes tomorrow. Kevin had given the ambassador his offical SKIF Ireland tie after he admired it.